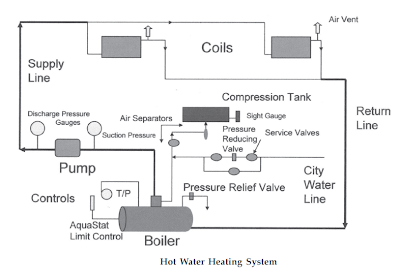 Hot water heating systems (Figure below) transport heat by circulating heated water to a designated area. Heat is released from the water as it flows through the heating unit (coil, terminal). Hot water heating systems produce heat more consistently than steam heating systems. The water in a hot water heating system remains in the lines at all times. The water in the heating unit lines heats and cools slowly, resulting in an even rate of heat production. When pressure is lost in the steam heating system, steam leaves the heating units resulting in a more rapid loss of heat than in a hot water heating system. In addition, the steam heating system has a longer recovery time in producing heat after the boiler is shut down. Boilers are used in both hot water heating systems and steam heating systems. The hot water heating systems most often encountered in HVAC work will be low temperature systems with boiler water temperatures generally in the range of 170-200 degrees Fahrenheit. Most of the steam heating systems will use low pressure steam, operating at 15 psig (30 psia, and 250°F). There are a great many types and classifications of boilers. Boilers can be classified by size, construction, appearance, original usage, and fuel used. Fossil-fuel boilers will be either natural gas-fired, liquid petroleum (LP) gas-fired, or oil-fired. Some boilers are set up so that the operating fuel can be switched to natural gas, LP gas or oil, depending on the fuel price and availability. The construction of boilers remains basically the same whether they’re water boilers or steam boilers. However, water or steam boilers are divided by their internal construction into fire tube or water tube boilers. I think the energy use to produce hot water instead of steam will also be very good step towards energy efficient systems. Much obliged for the significant data and bits of knowledge you have so given here. HVAC restore solutions were friendly as well as willing to emerge on the same day to have a look at the reason why the heating unit was not working. Lengthy story, short and a pair of times later on (he required to order a component for our heater) HVAC air condition repair solutions left all of us with the heat raging, huge smiles on the encounters and many of all an excellent impression associated with HVAC - HVAC repair services/ is highly recommend! BOILER OPERATION BASICS - HOW BOILER WORKS?